Khatami, M., Soltani Nejad, M., Pourseyedi, S. (2015). Biogenic Synthesis of Silver Nanoparticles Using Mustard and Its Characterization. 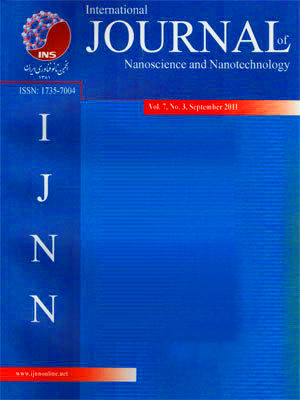 International Journal of Nanoscience and Nanotechnology, 11(4), 281-288. M. Khatami; M. Soltani Nejad; Sh. Pourseyedi. "Biogenic Synthesis of Silver Nanoparticles Using Mustard and Its Characterization". International Journal of Nanoscience and Nanotechnology, 11, 4, 2015, 281-288. Khatami, M., Soltani Nejad, M., Pourseyedi, S. (2015). 'Biogenic Synthesis of Silver Nanoparticles Using Mustard and Its Characterization', International Journal of Nanoscience and Nanotechnology, 11(4), pp. 281-288. Khatami, M., Soltani Nejad, M., Pourseyedi, S. Biogenic Synthesis of Silver Nanoparticles Using Mustard and Its Characterization. International Journal of Nanoscience and Nanotechnology, 2015; 11(4): 281-288. 11. Department of Biotechnology, Shahid Bahonar University of Kerman, Kerman, I.R. Iran. 3. Young Researcher Society, Shahid Bahonar University of Kerman, I.R. Iran. 22. Department of Plant Pathology, Shahid Bahonar University of Kerman, Kerman, I.R. Iran. 3. Young Researcher Society, Shahid Bahonar University of Kerman, I.R. Iran. 31. Department of Biotechnology, Shahid Bahonar University of Kerman, Kerman, I.R. Iran. The field of nanobiotechnology mainly encompasses with physics, biology, chemistry and material sciences and it develops novel therapeutic nano-scale materials for biomedical, drug delivery, cancer therapy and pharmaceutical applications. Silver nanoparticles (AgNPs) have unique physiochemical, biological and environmental properties which make them useful in a wide range of applications, so AgNPs was synthesized using mustard plant. The formation and characterization of AgNPs were investigated using UV-visible spectroscopy, Fourier transform infrared spectroscopy (FTIR),X-ray diffraction (XRD) and transmission electron microscopy (TEM). UV-visible spectroscopy showed surface plasmon resonance peak at about 411 nm. FTIR indicated the role of different functional groups (carboxyl, amine, aromatic and hydroxyl) in the formation process of AgNPs. TEM analysis showed spherical particles with size range 1-35 nm and an average size 14 nm. Our measurements showed that mustard seed exudates could mediate facile and eco-friendly biosynthesis of colloidal spherical AgNPs. Also, we studied influence of concentrations of silver nitrate on stability of biosynthesized AgNPs. The results clearly showed that the stability of biosynthesized AgNPs strongly depended on the concentration of used silver ions and increased with increasing the concentration of silver ions in the biosynthesis process. Our results indicated that AgNPs synthesized at higher concentrations of silver nitrate were more stable.